This topic provides an overview of the Gallery settings that can be configured. Gallery should be configured with an account wide default video player that will be used on your Gallery sites. 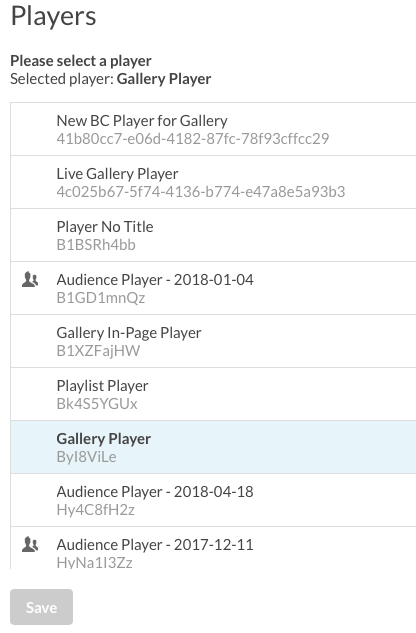 Players for individual Gallery sites can also be configured as part of the VIDEO AND PLAYBACK settings providing the ability to override the account wide default player. For more information, see Customizing the Player and Lead Form Settings for a Portal Experience. As a best practice, we recommend you create and style dedicated players for your Gallery sites. If you haven't created a dedicated player for your Gallery site, you should start by doing so. For information on creating players, see Getting Started with the Players Module. To configure Gallery with a default video player, follow these steps. Click Players in the left navigation. Select your account wide default player from the list of players and then click Save. Note: A default player must be selected or portal experiences will fail to publish. Audience-enabled players are indicated with the Audience icon ( ). 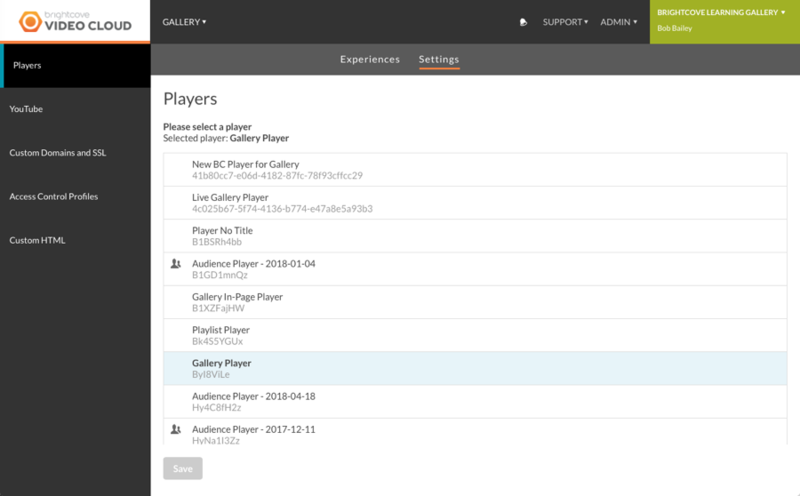 These players are configured with the Audience plugin and can track video engagement data. Hovering over the icon will display the Audience connection information. For information on creating Audience-enabled players, see Creating an Audience-enabled Player. Gallery sites can contain videos from your Video Cloud account or from a YouTube account. Before YouTube videos can be added to a Gallery site, the YouTube settings must be configured. For information on these settings, see Configuring YouTube Settings. When you first create a Gallery site, it is assigned a random domain with the format of <site-slug>.bcovp0rtal.com. Gallery provides the ability to publish Gallery sites at a Brightcove provided domain or using your own custom domain. Sites can also be secured using SSL. For information on configuring custom domains and SSL, see Configuring Custom Domains and SSL. For information on creating Access Control Profiles, see Controlling Access to a Portal Experience. Gallery provides the option of using a custom header and/or footer for all of your sites. This provides the ability to customize your Gallery sites so they more closely match the look and feel of your corporate sites. A custom header/footer can also be configured for an individual site. For information on configuring a custom header/footer for a site, see Customizing the Appearance and Behavior of a Portal Experience. Click Custom HTML in the left navigation. Paste the header HTML into the Custom Header HTML field. Paste the footer HTML into the Custom Footer HTML field.